A major research focus in the laboratory is metabolic alterations in tumor cells. These alterations often promote anabolic metabolism to support tumor growth, but also create vulnerabilities and dependencies within the tumor cells. We have found that synthesis of the cellular antioxidant glutathione is upregulated in PI 3-K/Akt-driven breast cancer, rendering these cells more sensitive to inhibitors of glutathione biosynthesis. The significance of this work is that, once identified, these metabolic vulnerabilities provide opportunities to target tumor cells. We are currently investigating other metabolites and metabolic pathways to determine their requirements and alterations in breast cancer cells, and how they are regulated by oncogenic signaling pathways. The goal of this work is to identify metabolic drugs and novel drug combinations that can be used to target breast cancer cells. 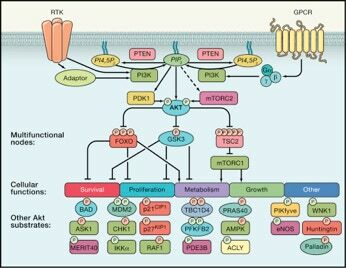 We are also investigating the mechanisms by which the PI 3-kinase and Akt signaling pathway regulates breast cancer progression. Genes in the PI 3-K pathway harbor some of the most frequent genetic lesions in breast cancer. Our studies have focused on the role of the Akt kinase in modulating breast cancer progression. We have discovered that Akt1 is breast cancer cell motility and invasion suppressor, a surprising finding considering that the PI 3-K and Akt pathway is clearly implicated in tumor progression. Conversely, the Akt2 isoforms is an enhancer of invasive migration and metastatic dissemination. The significance of these findings is that small molecule inhibitors of Akt, currently being developed by many pharmaceutical companies, may actually enhance tumor invasion and metastasis. We are currently investigating the mechanisms by which Akt isoforms control invasive migration in vitro and in vivo, as well as conducting phospho-proteomic screens for novel Akt substrates, and evaluating the mechanisms of resistance to targeted PI 3-K and Akt inhibitors.